If you can’t open a Word document that was created in an earlier version, first make sure the latest Office updates have been installed. Then, use the File menu to open the document. If that doesn’t work, use Apple TextEdit or an earlier version of Word to open it. 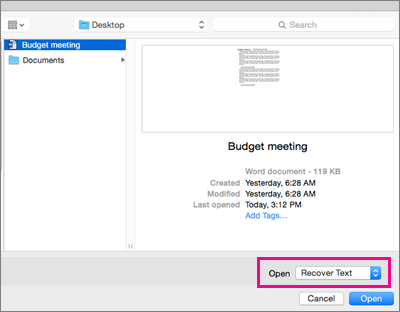 Also, now in Word 2016 for Mac, you can open Word files saved in OpenDocument Format (.odt, .ods, .odp) and convert them to editable Microsoft OOXML files (.docx, .xlsx, .pptx ). You'll need to be connected to the internet to open ODF files and convert them to OOXML files. For more information on the conversion process, see View OpenDocument Format (ODF) files in Office 2016 for Mac and Why do I need the Microsoft online service to open some Office files?. Note: In some cases, the document you are attempting to open is from a Word version that is so old the document cannot open in Word 2016 for Mac. In any Office program, on the Help menu, click Check for Updates. Under How would you like to check for software updates, click Automatically. Install all available updates and then try to open the Word document. In Word, on the File menu, click Open. Click the document once to select it. In the Open dropdown menu, select Recover Text, and then click Open. Note: When you open the file, some formatting might change. In the File Format dropdown, select Word Document (.docx), then click Save. If you have an earlier version of Word, like Word 2011, use it to open the document. If you don’t have an earlier version of Word, you might be able to use Apple TextEdit to open your document with basic formatting. If you still can’t open the document, it might be corrupted. Check for a different version of the file in Time Machine backups or wherever you backup your files. For information on working with corrupted files, see Troubleshooting damaged documents in Word for Mac.